A visible-light image of the Small Magellanic Cloud, combined with radio observation data (contoured lines). The blue circle marks where a strange 5-millisecond radio burst originated. A new andintense type of radio burst has been discovered in archived views of thecosmos, astronomers revealed today. The single,short-lived blast of radio waves likely occurred some 3 billion light-yearsfrom Earth, and it may signal a cosmic car crash of two neutron stars, thedeath throes of a black hole—or something else. "Thisis something that's completely unprecedented," said Duncan Lorimer, anastrophysicist at West Virginia University in Morgantown and the National RadioAstronomy Observatory who led the discovery-making team. He noted thatradio-emitting pulsarssend out similar emissions, but repeat them every few hours. "We'reconfused and excited, but it could open up a whole new research field,"Lorimer told SPACE.com of the 5-millisecond blip on the cosmic radarscreen. "If we really go after these things, we expect to find out that acouple hundred of them occur each day." Thediscovery is detailed in the Sept. 27 issue of the online journal ScienceExpress. 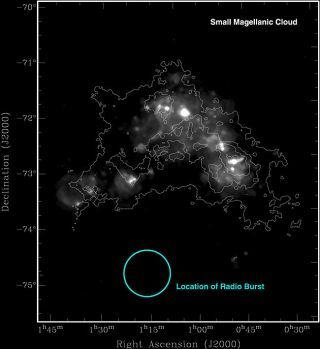 Thepreviously undetected radio burst was found in data from a 2001 radio survey ofthe Small Magellanic Cloud, a nearby dwarf galaxy. Based on its location,however, Lorimer said the burst almost certainly did not come from the galaxy. Lorimersaid the emission's offset location and wide dispersion made it"completely inconsistent" with that of a nearby object, whether inour own galaxy or the Small Magellanic Cloud. Astronomersoriginally created the 480-hour-long observation over 20 days to look for repetitive radioemissions from pulsars, which are thought to be fast-rotatingneutron stars, but the event remained hidden in the data because no one hadset out to find single bursts. "We'velooked at it for about 90 hours, and it definitely seems to be a singular event,"he said. Lorimercautioned that it's impossible to say for certain what the radio burst mightindicate at this point, as it is the only one that has been detected so far. "We'rekeeping very open minds about this thing," Lorimer said, adding that theiruncertainty stems from the inability to pinpoint it to a galaxy or othercelestial object that could reveal some clues to its identity. "We'reputting a lot of effort into poring through other radio data to find more ofthese things." So far, thesearch has left the researchers empty-handed, but it may be an issue ofsensitivity. Lorimer emphasized that the records are several years old and fewradio observatories have the sensitivity to detect such short bursts. "Based on the area we looked at, wethink this type of burst may occur at a rate of a couple hundred eachday," Lorimer said. He thinks that whole-sky surveys using next-generationradio observatories would be needed to detect most of them. If thebursts are as frequent as Lorimer's team thinks, and they indicate the death ofblack holes or two super-dense neutron stars violently smacking together, astep toward closure of the universe's great mysteryof gravity may soon come. Thedramatic cosmic events are predicted to let loose gravity waves that Einstein'stheory of relativity predicts, but the phenomenon has never been directlyobserved. LIGO—the Laser Interferometer Gravitational Wave Observatory based inboth Louisiana and Washington state—has been searching for such waves since itwent online in 2002. Lorimerthinks the singular radio bursts could give gravitational wave researchers somehelp filtering LIGO data, which contains noise from Earth-based activities suchas logging and highway traffic. "Thisfinding is definitely something LIGO will be interested in," said XavierSiemens, a gravitational theorist at the University of Wisconsin Milwaukee andLIGO who was not involved in Lorimer's study. He said the burst occurred aboutone year before the observatory began its scientific observations, soresearchers can't look for it in old data. "It'san exciting result, and if they eventually find that the bursts occur at ratesas high as they expect, then it's even more exciting to us," Siemens said,"because we should be able to measure them at LIGO."